A long and narrow sandy beach popular with the islands surfers when the wind blows in from the east making waves that tend to be a bit shy here on the island. Cala Nova beach is split into two by some rocks so don’t be fooled into thinking you have come to the end. Popular for lunches as there are numerous restaurants all the way along. Great for swimming but the current can get quite strong so keep an eye on the little ones. Not much to see if snorkelling is what you are looking for. Cala Nova beach can be reached from the town of Es Canar or from San Carlos. From San Carlos follow sign towards Cala Leña and then veer off. From Es Canar, follow sign towards Atzaró Beach Restaurant. 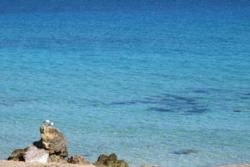 Cala Nova from Ibiza.travel on Vimeo.